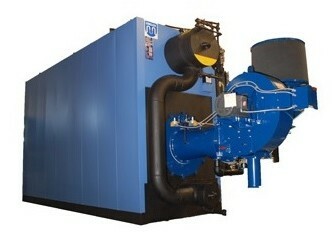 Low pressure boilers are often box-like and constructed from stainless steel, aluminum, steel or cast iron. Inside the housing is a furnace to burn the fuel and an arrangement of pipes, valves and drums. The flue is the chimney that releases the steam into the system or atmosphere. Low pressure boilers are most frequently used for generating steam rather than for heating water. Because boilers do not control the pressure or flow of hot water into a shower head, for example, low pressure boilers would offer little difference from any other boiler like a combi boiler. Low pressure boilers can range in size but generally do not require the large amount of space that high pressure boilers need. These boilers are typically used in industrial, commercial or manufacturing applications for jobs that require lower pressures, such as space heating. Residences, schools, offices and other average buildings generally do not rely on low or high pressure boilers for heating purposes. There are two main ways boilers generate steam and hot water. Fire-tube boilers direct the heat produced from burning fuel such as wood, coal or natural gas through heat exchanging tubes that are immersed in water. Thermal energy is transferred from the tubes into the water; the steam is then collected or the water pumped out. Water-tube boilers have water that circulates inside tubes that are exposed to heat. Thermal energy from the tubes moves into the water, heating it and resulting in water vapor and hot water. Water-tube boilers are typically used in high pressure applications because they are capable of safely reaching 1,000 PSI. Some facilities have both kinds, using water-tube boilers with high pressures for process loads while the low pressure fire-tube boilers are used for heating water and space heating. In fact, the two kinds can be combined in the same area. When high pressure or high temperature steam suddenly decreases in temperature, flash steam is formed and, if there is enough of a pressure difference, is used to supply steam to the low pressure boiler. Regardless of their power, all boilers have safety valves to keep the appliance from operating at dangerous levels. Low Pressure Boilers Low pressure boilers are tanks or vessels that facilitate the transfer of heat from its source to water or steam at pressures below 15 PSI. Though high temperatures within an enclosed space result in increased pressure, these boilers are able to keep pressure at or below the atmospheric pressure of ~14.7 PSI.